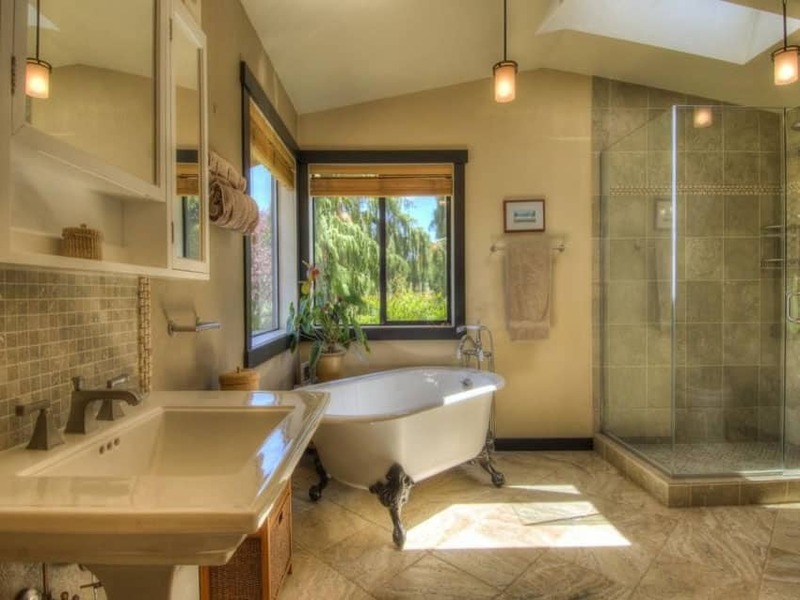 This gallery features beautiful bathrooms with clawfoot tubs. Below you’ll find pictures of a variety of clawfoot bathtub styles so you can find the one you like best and is ideal for your space. Clawfoot bathtubs have been around since the late 1800’s and have always been considered a luxury. 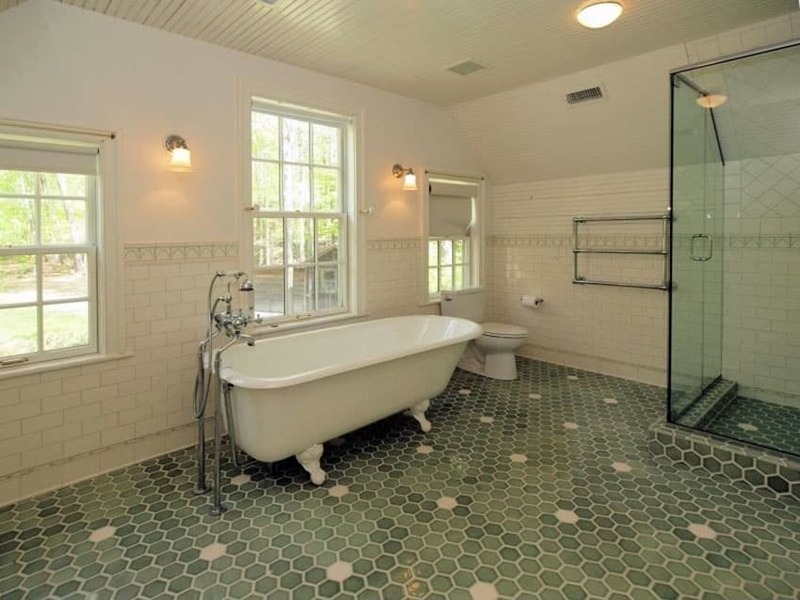 These types of tubs are generally constructed from cast-iron with a porcelain coating, or from acrylic. – Traditional roll top rim claw foot tub – The most common style of tub with a classic shape with a sloped backrest on one side. – Slipper claw foot tub – This tub design has a high back on one side for enhanced comfort. – Double ended claw foot tub – This type has rounded ends on both sides giving you the choice of either side as a bathing position. – Double slipper claw foot tub – Has a rounded end on both sides with a high back construction for additional comfort. This refreshing master bathroom incorporates high quality materials such as marbled floor and marble counter. Multiple lamp scones used for mirror lighting and a chandelier for ceiling light adds an elegant accent to match the classic double-ended claw foot tub. Custom design cabinets are installed for more storage space. Light curtain fabric allows light to pass through and gives a silhouette of the beautiful landscape outside. This bathroom has a unique sage green wall color, giving it an earthy and cool feel, and is paired with simple white marble floors and mosaic tiles. 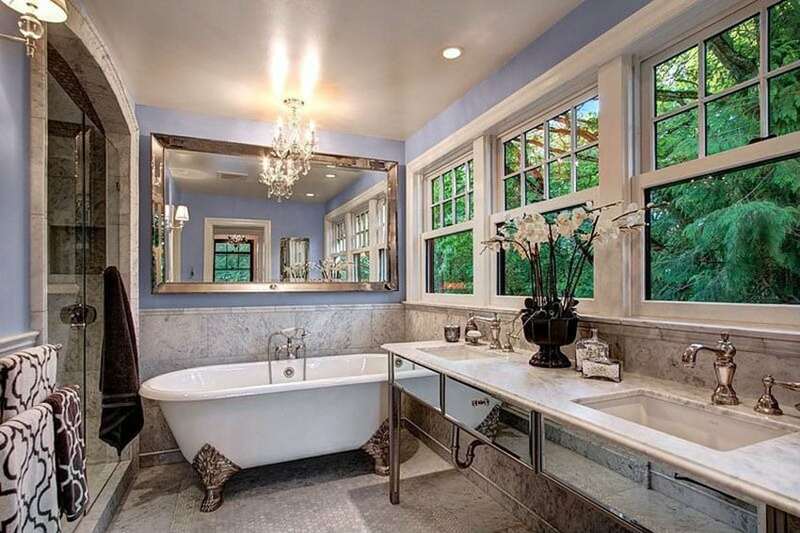 The freestanding bathtub with silver legs is placed beside the bay window area and given more emphasis through the use of a small crystal chandelier. The crystal chandelier ceiling light is an elegant way to set a perfect tranquil mood lighting as you unwind for the day. 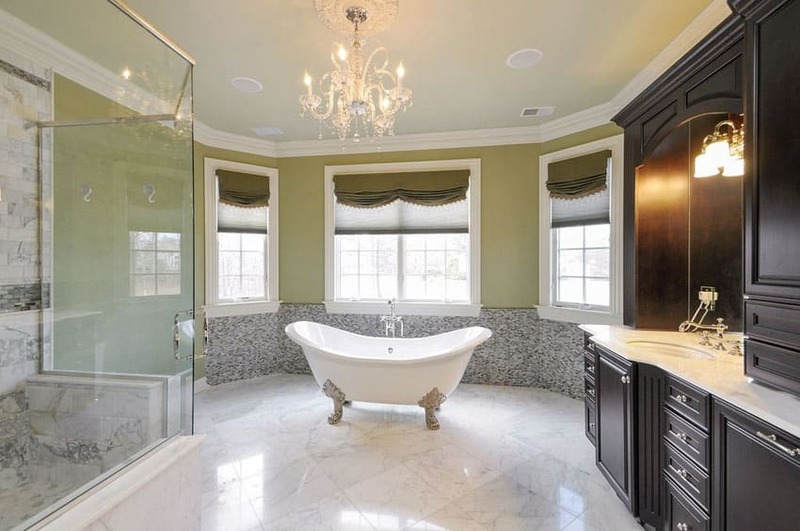 The star of this master bathroom is the white double slipper claw foot bathtub with nickel feet, placed in the middle. A simple glass screen fixed on a marble wall of the shower area prevents water from splashing on the marble flooring. Wenge vanity cabinet in oil finish with a marble counter top gives contrast to the color scheme of the space. 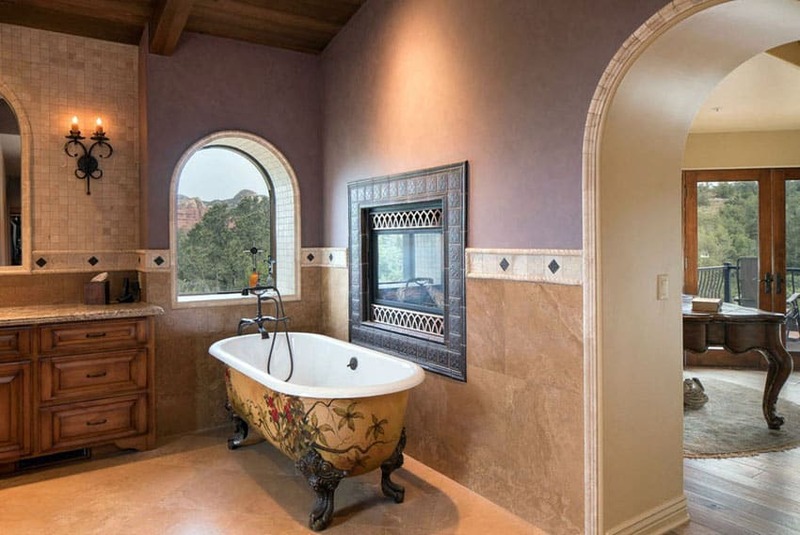 This traditional master bathroom shows elegance by having a free-standing slipper claw foot tub in the corner of the room where you can enjoy the view through two corner French windows. The soft and restrained color palette of the walls, white marble counter top and white square field tile is accented by the gray color scheme from the vanity cabinet and heavy draperies. 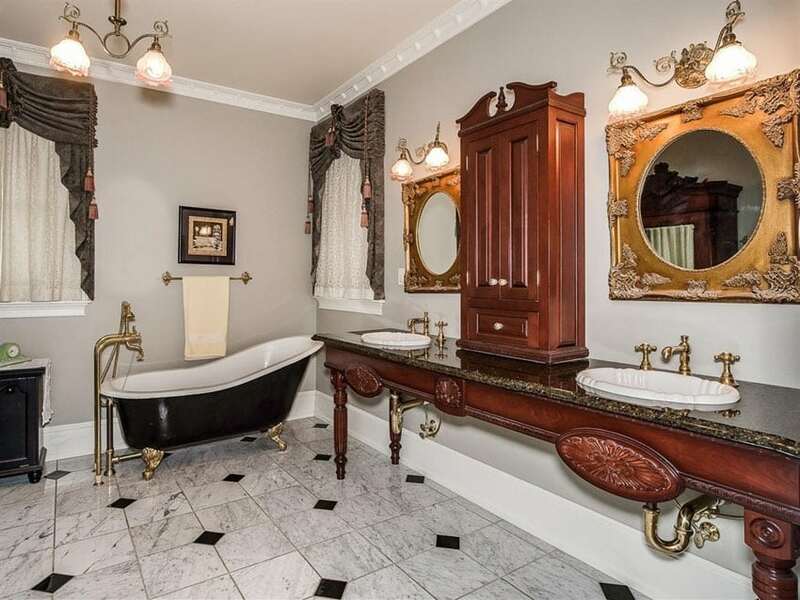 Marble vanity counter top, crystal task lighting and bronze-feet cast iron claw foot with the classic roll rim gives this traditional master bathroom a remarkable lavish appearance. To contrast the arched passageway, are the geometric pattern design of simple rectilinear lines of the windows, wall panels and straight columns. A classic roll rimmed cast iron claw foot tub with lion paw feet is simply placed by a bay window. Floor to ceiling tempered clear glass shower partition allows you to enjoy the view of the beautiful garden outside. An area carpet provides a slip-resistant surface as you climb out of the tub and protects the natural stone flooring. Recessed white wainscot panels works perfectly well with the soft lilac color painted walls, white cornice and white painted door and door trim. The penny shape mosaic tile create interest and capturing the appeal of the all-white roll top claw foot soaking bathtub and pedestal sink. A rustic vanity and a fan-back Windsor chair with a round mirror give accent to this master bathroom. Polished brass can be seen all throughout this period style traditional master bathroom. Stained wainscot mahogany walls combined with dark vertical wallpaper, pendant lights, and sconces add extra warmth and decorative touch. The stylish details of this vintage claw foot tub with shower enclosure creates an alluring ambience and a stunning centerpiece. Textured white ceramic tile with a dark marble border and diamond pattern mimic a natural stone flooring. 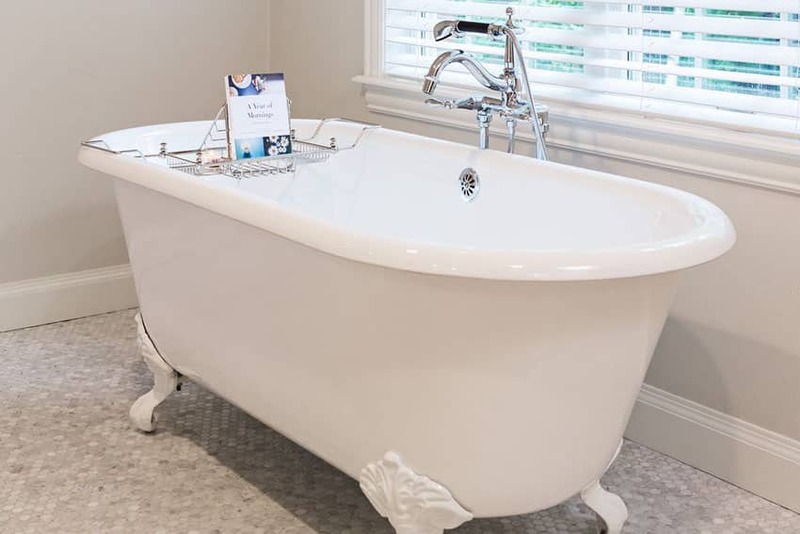 Spend time soaking in a hot bath in this gorgeous porcelain cast iron claw foot tub. Mosaic floor tiles are used for a textured flooring and achieving contrast throughout this art deco style bathroom. Wall mounted double sink marble counter top saves a significant amount of space in this fairly narrow master’s bathroom. Mirror-face drawers provides an illusion of added space and wainscot inspired stone walls finish the design with a touch of elegance. 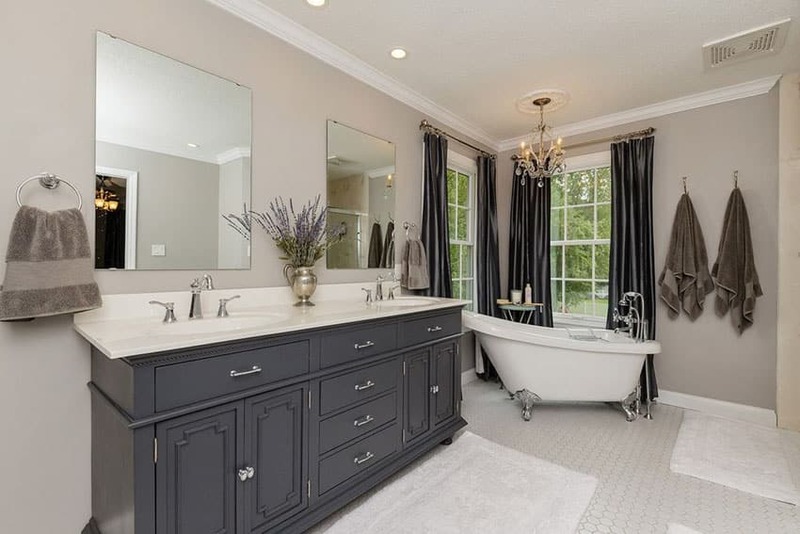 A free standing hard wood vanity with double porcelain sinks, marble counter top, brass framed mirrors and bathroom fixtures is another period style master bathroom design. Vintage style acrylic slipper claw foot tub with gold lion feet is painted in black and goes perfectly well with the patterned marble flooring. 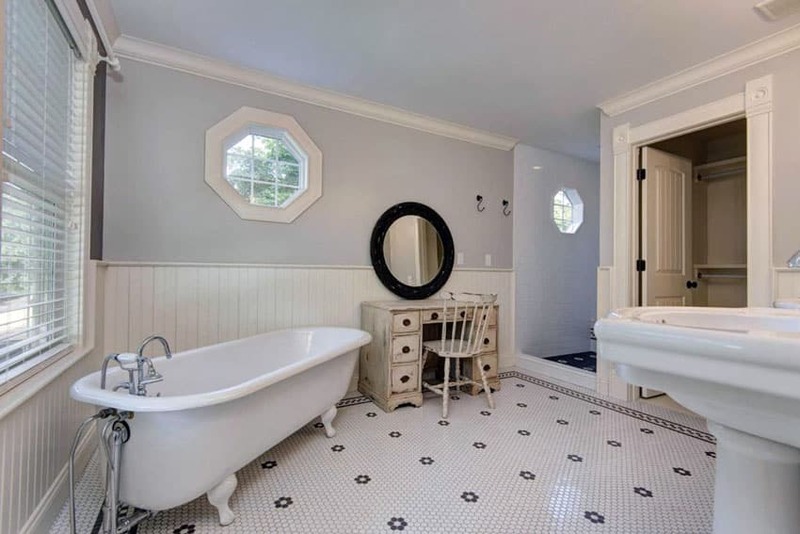 Relax in this romantic and simple bathroom soaking in a charming double slipper cast iron clawfoot tub. The natural stone flooring which extends through the floor to ceiling glass enclosed shower prevents slippage in both areas. This elegant custom painted claw foot tub placed near a tile framed fireplace surrounded by marble walls with patterned geometric boarder gives this bathroom an aristocratic characteristic. 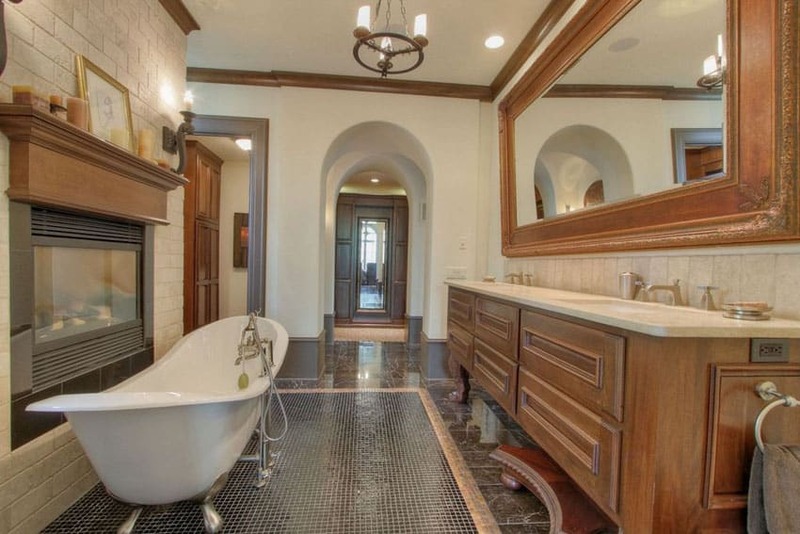 Designed with arched window and passage way, mosaic tile wall with a rustic candle style wrought iron wall light, heavy wood vanity with granite counter top and natural stone flooring reflects upon a classical era. A mix-and-match motif of this bathroom, uses the unique shape and natural tones of pebbles and stones combined with wood parquet flooring brings the beauty of nature from the view of the backyard indoors. 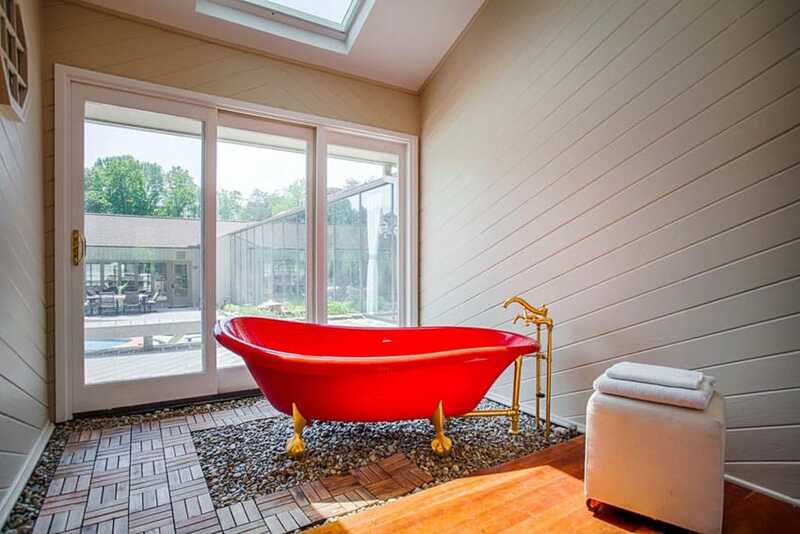 A red acrylic claw foot bathtub with gold feet and gold faucet fixtures creates a lovely accent. Soothing sea green hex mosaic tile flooring which also extends to the glass enclosed shower area mimics a coastal style bathroom. Relax in this simple white vintage classic roll rim cast iron claw foot bathtub while enjoying the view of the outdoor landscape. 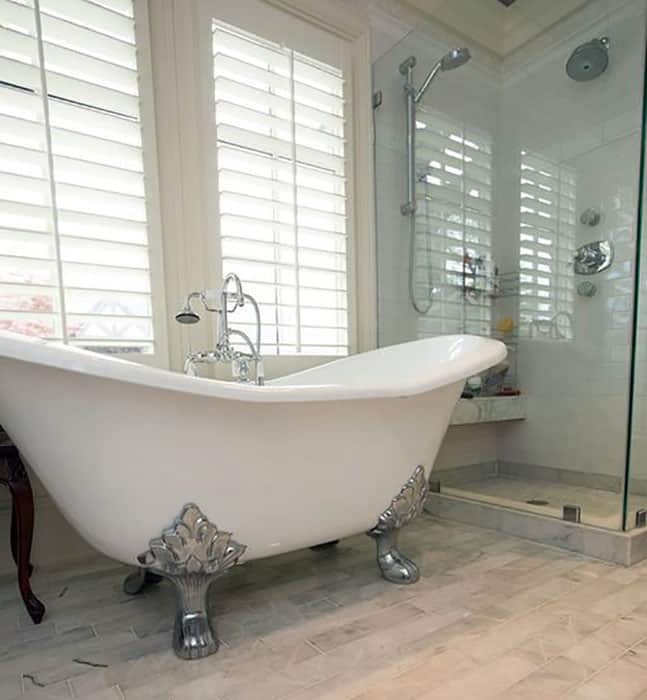 Enjoy the flexibility of sitting at the either end of this bathtub, soaking in a hot bath while looking over the foliage of trees in this vintage rolled rim double ended claw foot tub with white feet. Mosaic flooring prevents slippage and adds texture to this simple bathroom design. Instead of being placed near a window, this double slipper cast iron claw foot tub is positioned near a fireplace with a solid wood mantle. Mosaic floor tiles underneath the tub is bordered by travertine natural stone giving a unique pattern and character. The massive hard wood vanity cabinet with under-mount sink topped with a granite slab provides a contemporary and luxurious there. 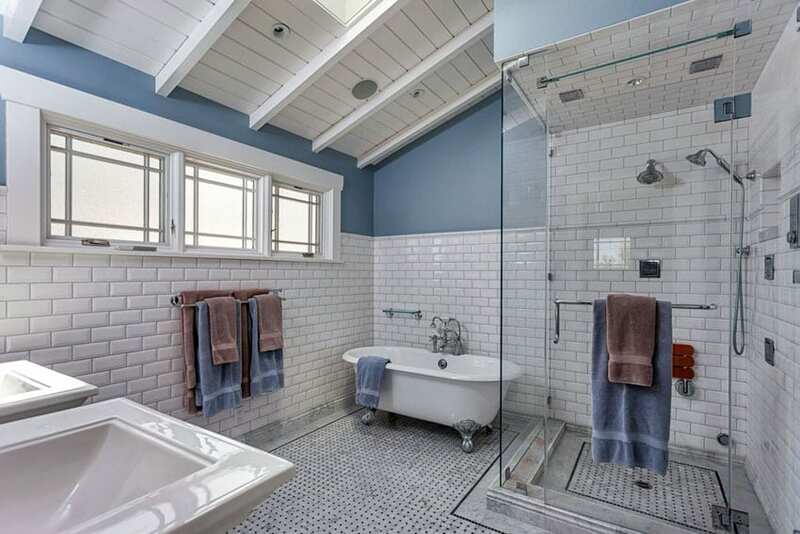 A gorgeous contemporary bathroom with a claw foot bathtub and silver feet is surrounded by a classic subway tile wall. Its mosaic floor tile with a slim black line border accentuates the space for bath and shower area. Three-panel windows, two pedestal sink and pine plank ceiling gives this bathroom a relaxed country style design. Pale blue walls accented by uniform size picture frames, French-type window and pale grey marble floor help create an elegant and dreamy bathroom. Low wall partition separates the shower, bath and lavatory. Cottage style bathroom accessories such as free-standing towel rack and basket holds extra towels. 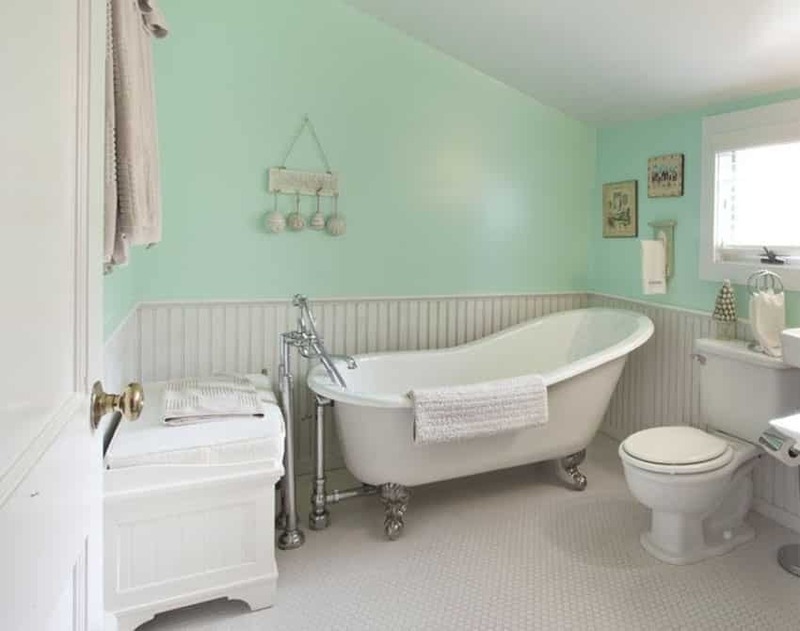 Another cottage style bathroom idea is designed with a slipper claw foot tub with silver feet and silver faucets, white pine wainscoting wall panel, white mosaic tiles, white wood bench with cushion is accented by the mint green painted wall. An Arts and Crafts inspired design gives this bathroom an earth tone color palette. The charming Craftsman-style master bathroom has the hallmark of using natural porcelain tiles for the floors and walls. Bordered mosaic tiles are used for the pedestal sink and a white acrylic slipper claw foot tub shows an ultimate American Design. 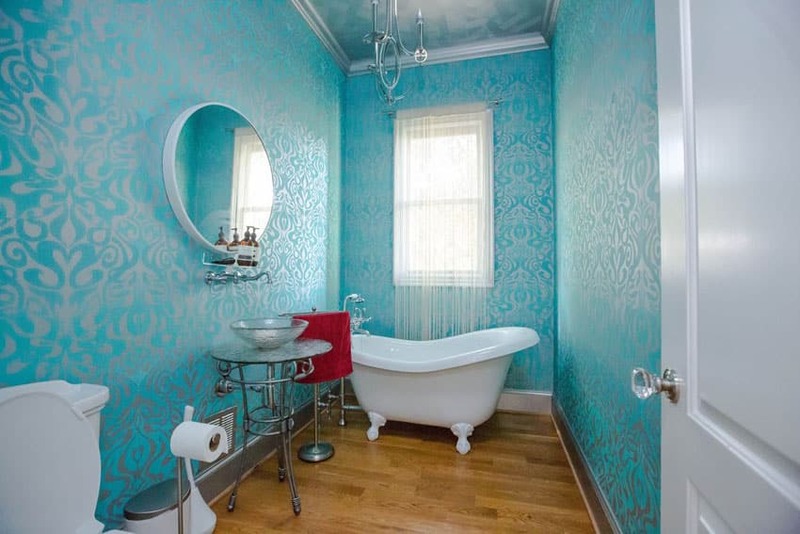 Let your imagination run free and wild with this eclectic bathroom. Patterned wall paper, faux wood ceramic tiles, custom painted ceiling, wrought iron candle style chandelier, floor lamp shade for an added drama, a wrought iron glass top pedestal sink and an acrylic claw foot tub with imperial feet completes this mix-and-match style. 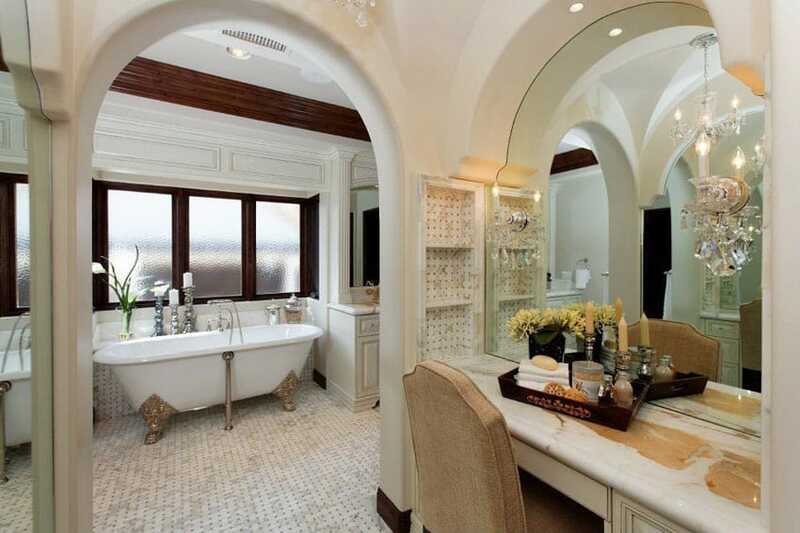 A luxury master bathroom designed with a sitting area with a tufted lounge chair. 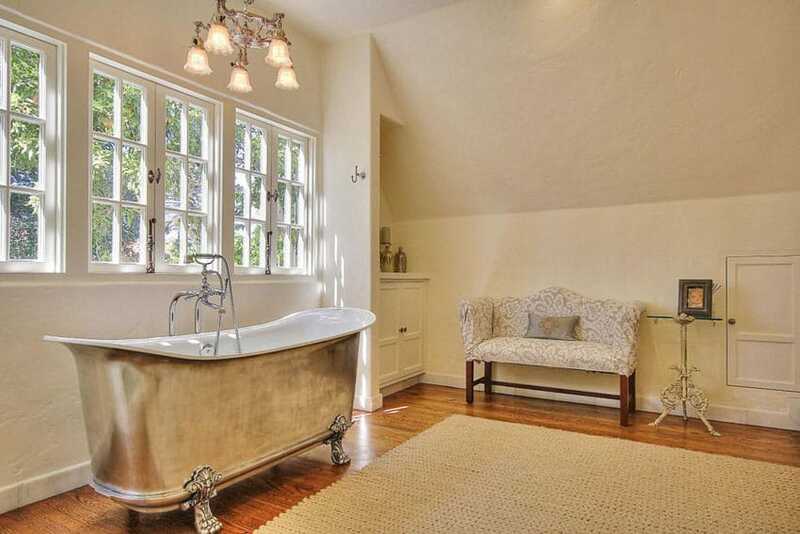 Soak in this claw foot tub with gold feet. The patterned marble flooring works well with the massive dark tone hard wood vanity with marble counter top and two sets of drawers. A traditional brass chandelier pendant with candle lights and candle style double wall light gives this bathroom a cozy lighting effect. A simple and yet elegant master bathroom design uses an aged chrome cast iron double ended claw foot bathtub, ceramic medium tone fauxwood tiles, a pendant chandelier and a sitting area with carpet. 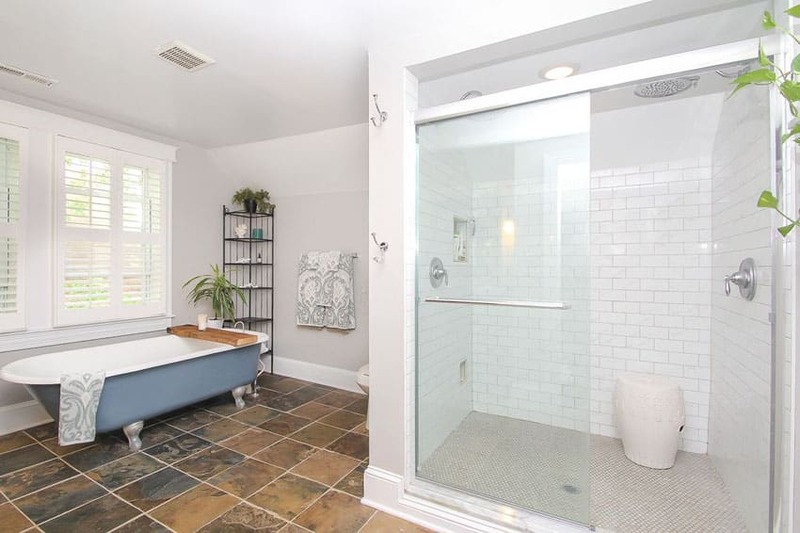 Definitely fitting the category of beautiful bathrooms with clawfoot tubs is this serene escape master bathroom with a claw foot tub with lion paw feet. 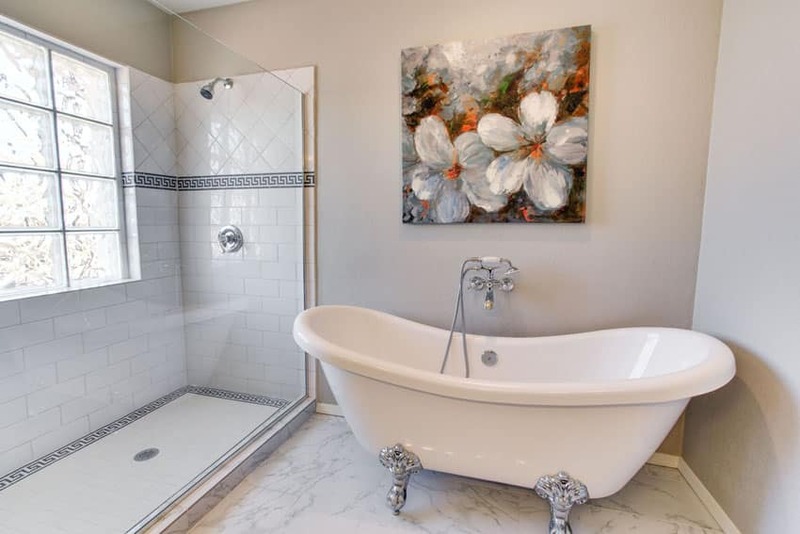 Placing the tub away from the window provides more privacy and looks elegantly positioned as the room’s centerpiece. Known for its durability and low maintenance, two tone marble is used for the patterned tile flooring and wainscot wall. The deeper dark tone marble is used for the counter top for continuity of design. This gorgeous master bathroom use high quality slate flooring with fine grains and rich color palette – a perfect accent to the white painted walls, white subway tiles and to the clear glass shower enclosure. 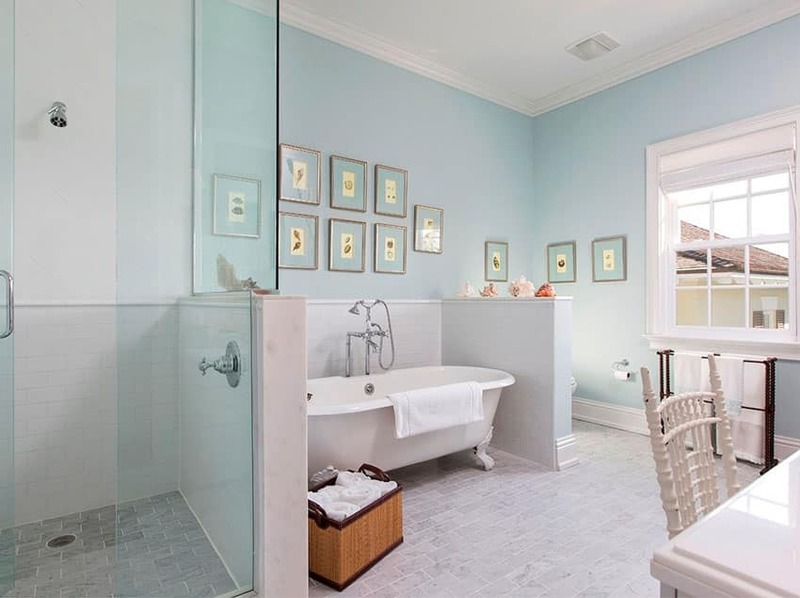 The French Bateau claw foot tub painted in powder blue color gives this bathroom a touch of softness. 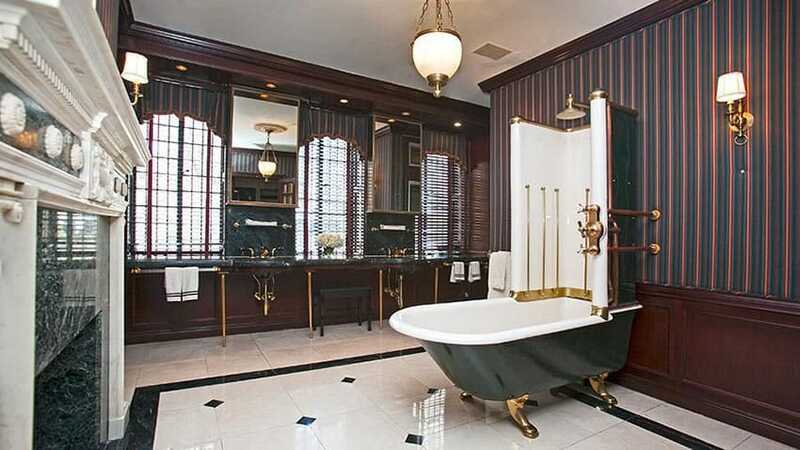 A grand bathroom fit for a king is designed with medieval royalty in mind. 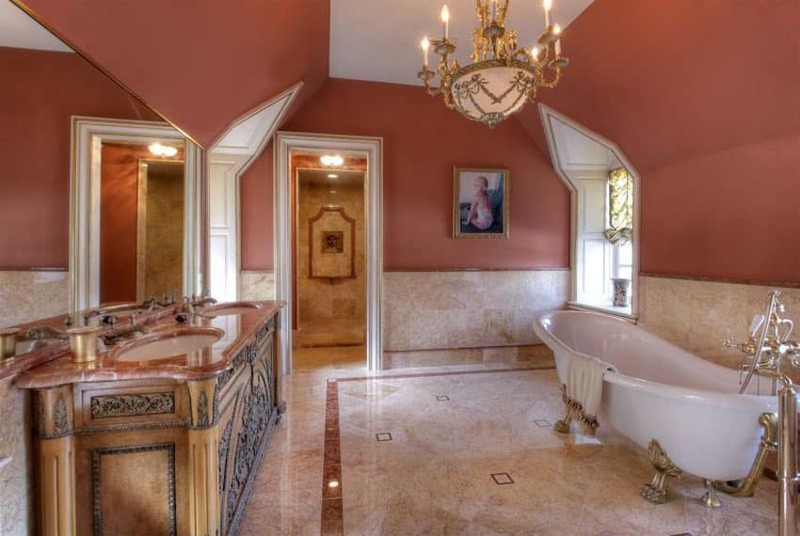 Rustic textured wall which mimics the marble floor, brass wall sconce, free-standing heavy hard wood vanity with marble counter top, large framed mirror, a copper claw foot tub, bronze and marble sculptures accents are typical elements of a period style bathroom design. A Greek inspired bathroom is decorated with Rosalind acrylic claw foot tub, Carrera marble flooring, dark grey Greek key boarder paired with white subway tiles and highlighted by a classic rich color artwork. All elements mimics the beauty of ancient civilization.